Click on the image for a larger view of the candy and gift box. A premium Halloween candy, Made in Vermont! We couldn't be more happy with how this chocolate-maple candy turned out. The design is simply perfect! Best of all, this Halloween candy is only available here. You won't find it in the aisles of box stores. No sir! This one is unique. 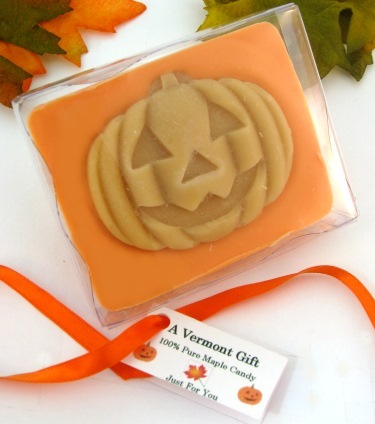 Made with 100% Pure Vermont Maple Syrup, supplied by small maple sugarhouses, this large pumpkin-shaped maple sugar candy is the ideal Halloween gift, generously sized and delicious! Each pumpkin maple candy is surrounded by a bar of luscious chocolate, then individually boxed in a clear 2-piece plastic candy box with custom orange ribbon pumpkin tag. 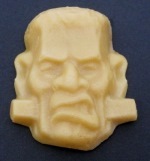 Each candy is a hefty 2-3/4" x 3-3/8" x 1/2" thick and 3.5 oz. of Halloween treat! 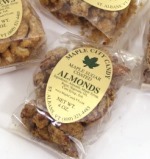 Quick Delivery - Order one or two Pumpkin Chocolate-Maple Candies and shipping is just $5.95 Priority Mail!